UH 79 Sandy Alomar Jr. UH 116 Jerry Hairston Jr.
2006 Topps Updates & Highlights Baseball is one of the weakest checklists in the history of Topps Traded and Topps Update sets. A casualty of new rookie card rules, the set has very few actual rookies. Instead, collectors are left to look to the inserts for a little more excitement. Beginning in 2006, it was mandated that official rookie cards only be released after a player made their big league debut. At that point, they could have a "rookie card" logo attached to their cards. The idea was to simplify things for collectors. While it has had mixed results, it caused a lull in rookies for a couple of years. Many of the players given the mandated rookie logo had fully licensed base cards in sets from previous years. 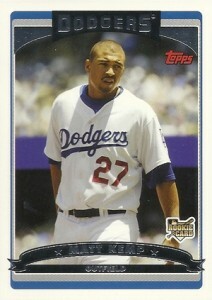 2006 Topps Updates & Highlights Baseball has several such players, including Matt Kemp, Jered Weaver and Cole Hamels. The set keeps the same design as 2006 Topps Baseball. The main difference is the numbering on the back. Update cards have the prefix UH. The 330-card 2006 Topps Updates & Highlights Baseball set has several subsets including postseason highlights, season highlights, league leaders, All-Stars and Home Run Derby participants. Card 73, Cory Lidle, is a memorial card. The pitcher was killed in a plane accident in October, 2006. Five parallels compliment the set: First Edition (one per hobby box), Gold (#/2006), Black (#/55), Printing Plates and Platinum (1/1). Hobby boxes come with a Chrome Rookie card numbered to 599. Each of the 50 cards in set set has a Refractor parallel numbered to 25. Two massive mirror sets continue in 2006 Topps Updates & Highlights Baseball. Barry Bonds Home Run History celebrates homers 709 to 734 of the controversial slugger's career. There is also a special card for Bonds' 715th career big fly. Mickey Mantle Home Run History carries on with homers 102 to 201. The only other basic insert in the release is Rookie Debuts (45 cards, inserted 1:4 packs). Most of the autographs and relic cards have an All-Star theme, the most common of which are All-Star Stitches which have a piece of warmup jersey from the midsummer classic. Other memorabilia sets include All-Star Patches, Touch 'Em All Relics and Derby Digs Relics. Autographs include Rookie Debut Autographs and Signature Moves.